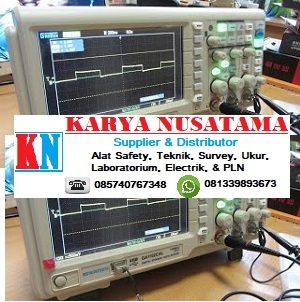 Hubungi Karya Nusatama 085740767348 / Wa 081339893673 untuk pemesanan Digital Osciloscope Gratten Type GA1102CAL di Makasar, selain itu kami juga menjual berbagai alat listik, penangkal petir, alat safety, alat teknik, alat ukur, alat survey, alat geologi, sirine, alat optik, lampu emergency, alat hydraulic, safety shower dan lain sebagainya. Free ongkir khusus untuk daerah jakarta dan sekitarnya. An oscilloscope can be a very handy instrument to keep on your workbench and this GA1102CAL digital storage oscilloscope will help you take your circuit analysis and troubleshooting to the next level. This 2-channel, 100MHz digital scope has a 1G Sa/s real-time sampling rate and comes with everything you need to get up and running. Each of the two included probes features an attenuation switch which will limit the bandwidth to 10MHz. USB-host functionality allows the scope to save waveforms to any USB flashdrive and USB-device functionality (accessible via the USB-A port on the back) allows the scope to communicate with the included software so you can import waveforms and data to the computer as well as software-control the scope. The scope also supports PictBridge compatible printers. The 7" color TFT display and on-screen menu system make it easy to access all of the features of the scope.